Reiki can help you in so many ways, from energizing your life force to calming anxiety and reliving depression. When we have experienced so much in life it weighs on us, we have all heard the expression "carrying the weight of the world" well this is somewhat true. Energy clings to us everyday, the good and unfortunately the bad. I think that anyone can relate to being in a line up somewhere and getting the feeling of anxiousness or agitation or even anger. You could have walked into that store in a great mood, but come out miserable! This is the negative energy we collect and hold on to till we release it with some form of mediation or something that gives us peace but how many of us do that everyday? Not many... Yoga, working out, running, camping, and so many other ways we look to relax and re-energize but it does not happen nearly as often as we like. So this is what Reiki can do you for you, this helps you release ALL of that energy. Then there are the situations that are not from outside forces, things like relationships, work, family and just LIFE in general. Depression and anxiety is probably one of the most common symptoms caused by what we have to deal with daily and one day it just becomes to much to handle. Reiki clears and releases this energy build up and opens the blockages that are created thus allowing a flow of love and good energy through your life force and all chakras, giving you peace and relaxation. There are seven main energy points call Chakras, these each have their own function and energy force. 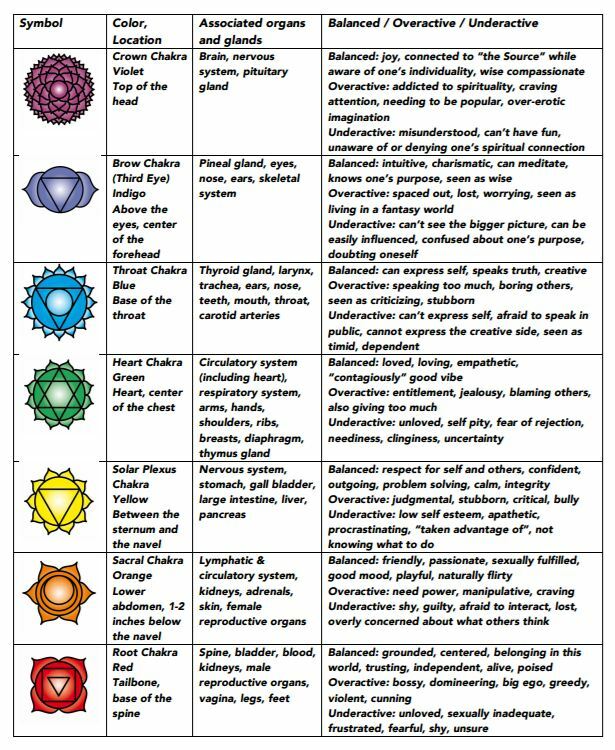 I could go into each chakra with great detail and write a book about them, but instead I will give you a quick run down of where your chakras are , colors associated with them and how Reiki helps with balancing them. Starting from the bottom and working our way up we have the Root Charka (black/red) located in your pelvic area, sacral chakra (orange) is right about where your naval is, solar plexus chakra (yellow) is just where your rib cage ends, Heart chakra (green/pink) is in the middle of your breast bone, throat chakra (turquoise/sky blue) is exactly that in the throat, third eye (dark blue/indigo) is between your eyebrows and lastly is the crown chakra (violet/white) which is just above the to of your head. When blockages occur in your chakra energy this can cause a "pile up" so to speak, where the energy is not flowing from the ground up but has stopped at certain point. Well that depends on the situation, since each chakra has a function of our emotions they can become blocked by what we have experienced. So lets use me as an example since its easier to relate to someone who has actually experienced this first hand. I never thought a person could die from a broken heart but I sure know that differently. Having my heart not only broken but my pride, my self esteem and self worth were destroyed by a single event. I hit rock bottom and was depressed and held onto the past like I was clinging to a life raft. My heart chakra was completely blocked thus creating so much more damage to the rest. All the self doubt, low esteem, inability to express myself, feeling of disconnect was a result of this massive blockage and created a "pile up". I went to my first Reiki session and WOW I was amazed at how different I felt, not only did I feel about 10lbs lighter I felt relaxed and calm for the first time in a long time. The next few months my quality of life started to improve and I felt a sense of peace but I knew I needed more of this Reiki. My second session was what brought me out of the dark clouds and opened my life force to a flow that I hadn't ever felt, thus my path changed and here I am today years later living a great life and being happy for the abundance I have. All that blockage was healed and I still continue on this path of self healing because even though that event was in the past life is still life and we still need to keep the flow of energy and the chakras open. I hope that after reading this you can see what damage can be done by a blockage, this is only one small example, the list goes on and each person is different. Chakra's are not always blocked they also can because low in energy and just need some re-energizing. Wearing colors, essential oils, stones and gems are ways to help bring energy to the ones that need it.